If you don’t get the Harry Potter “thing” after reading the first book, you’re dead to me. This is the only review I’ll do this for, but it’s apropos since it’s also the first book of the seven book series; I need to give some backstory here. I’ll be doing a review of each book as I make my way through the series (and maybe other things, if it occurs to me) and then afterwards, lists and such. Finally, said friend convinced me to watch the first movie. Then the magic — first pun fired — seeped into my brain and the rest — cliches, too? — was history, as they say. Oddly enough, I didn’t then go back and read the first book and start the series that way. Instead, I read the second book in anticipation of the second movie, then proceeded accordingly with the third and fourth and so on. And let me tell ya, that younger glee me was needed because I’ve been in a nasty funk for the last week, ever since I got back from Orlando, really. And it was an especially pronounced funk on Friday and Saturday night, but I’ll spare you the details. 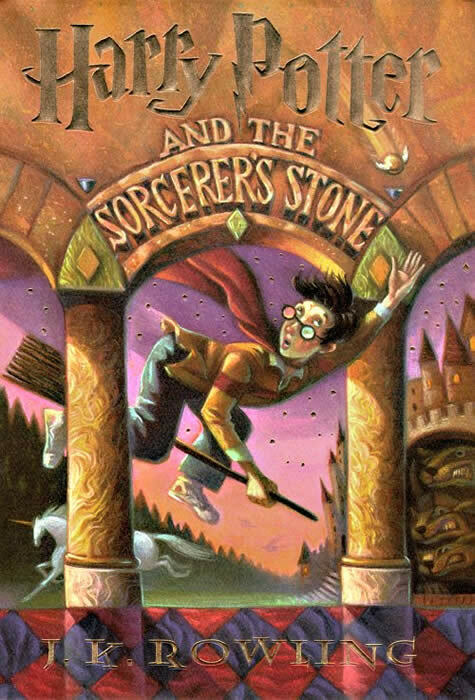 Suffice it to say, randomly and whimsically — as that’s how I roll — deciding to re-read the Harry Potter series again (I had previously done this in 2011 in anticipation of the last film) brought me roaring out of that funk. I’m sure the funk will come back around, but for now, it’s Harry Potter. The first book of the series is our introduction to the magical world of wizards, witches, goblins, giants, dragons and all manner of magical creatures and magical spells and magical living and the quirkiness that accompanies it. The setup is so simple, but forever endearing and charming and what’s appealing about the story: Harry Potter is quite literally the “boy who lived” against the Hitler of the wizarding world. He’s famous and respected as a 1-year-old in that world, but in the Muggle word, i.e., non-wizards and witches, he’s a nobody and his terrible uncle and aunt treat him as such (his parents were killed in the attack on him — another classic archetype of a hero). It’s the perfect setup for a fantasy: you’re treated like crap by your aunt and uncle, thinking life can’t get much worse than this, but then it turns out, you’re actually a wizard that gets to go and attend school at this amazing magical place known as Hogwarts and your famous AND your rich as hell? I mean, come on. What kid wouldn’t love that? And right away, to counter the awfulness of those characters, for one, you’re already sympathetic to Harry, but there’s also the lovable giant, Hagrid that comes to Harry’s rescue. He’s just goofy, fumbling, but he has a good heart and loves Harry. Hagrid is the one that helps Harry realize he’s a wizard and gets him to Hogwarts, school of witchcraft and wizardry. Rowling is only scratching the surface on developing this world in the first book, but as a reader of the whole series, it’s utterly fascinating to see the little details she sprinkles in that she fully fleshes out much later in the series; it’s like, how did she already have the forethought to plant that nugget of information? After doing so, though, we get to the main thrust of the story: Voldemort is not gone, of course, and is looking to regain life by stealing the Sorcerer’s Stone, which would make him immoral and he goes through the Defense Against the Dark Arts teacher to do it. Unfortunately for him, he’s running up against Harry Potter, his ginger friend Ron Weasley, and their brilliant friend, Hermione Granger and of course, behind all of them stands Albus Dumbledore, the greatest wizard of all time and the one Voldemort is said to fear and also, the headmaster of Hogwarts. But the gang thinks it’s the Potions professor, Snape, and that only turns out to make Snape a great nemesis for Harry as the series goes on. The first book is certainly written with children in mind. After all, its protagonist is an 11-year-old boy and his 11-year-old friends. So that makes for an easy, but enjoyable read (it’s only 310 pages, much shorter than the later books). As you’ll find, Rowling, like her characters and her readership, matures the story as the books progress (and the length of the books, as I said).